At Loads of Vans, we specialise in Citroën, Fiat, Nissan, Peugeot, Renault and Vauxhall to give you the lowest price on new vans. You are guaranteed the best value because of our Price Promise* - WE WILL NOT BE BEATEN ON PRICE. With over 500 vans in stock we provide the best choice available. We know that you're busy and business can't afford to be slowed by waiting for a new van which is why 90% of our vans have immediate delivery. This means that you don't need to hang around waiting for your new van, you can just carry on as normal. If you come to us so that you can get the best price, we offer nationwide delivery**, so you don't need to worry about how to get your new van home. If you live within 20 miles of our North Cheam showroom then we will deliver your van for FREE (subject to driver availability). We do more than just sell vans, we're the complete package and can offer you insurance, warranties, accessories and servicing for your new van to make sure that you have everything you need. 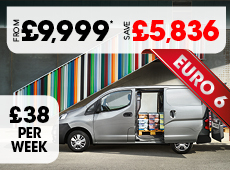 We have excellent offers available on a HUGE range of vans. Click the link below to view our latest stock. *Price promise only applies on like-for-like vehicles. **All new/pre-registered vans are subject to manufacturer delivery charge.